Ian Whates lives in a sleepy Cambridgeshire village with his partner, Helen, and a manic cocker spaniel called Bundle. 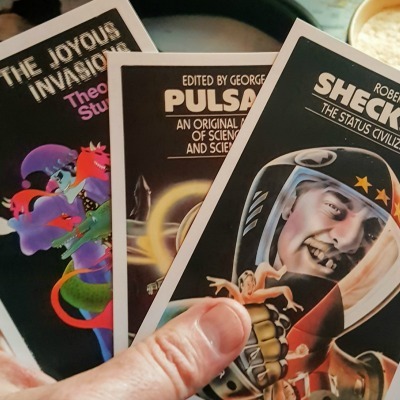 A writer and editor of science fiction and fantasy, he is the author of seven novels, the co-author of two more, has seen some seventy of his short stories published, and has edited more than thirty anthologies. Ian served a term as a director of SFWA and is a director of the BSFA, an organisation he chaired for five years. In 2006, Ian founded multiple award-winning independent publisher NewCon Press by accident, and he continues to be baffled by the number of titles the imprint has produced. Mark “the Encaffeinated ONE” Kilfoil loves fiction, so much so that he’s written some (such as the Parsec-nominated Tainted Roses), read quite a lot (a library of over a thousand half-read books and growing) and now narrates them (sometimes actually recorded for others). He can be heard frequently on CHSRfm.ca, and two of his shows regularly appear as podcasts, and can be found at encaffeinated.ca and theweirdshow.com. He likes cats enough to pet them but not enough to own one, and computers enough to own several but pet none of them. He will someday write a million words, but at this rate, that will require life extension, so he eagerly awaits the ability to upload into a computer, if that hasn’t already happened and this is all only a simulation. Don’t forget Science News by J.J. Campanella! Great story–it just so happens that I’m currently reading Samuel Delany’s DALGHREN, where we first encountered “Scorpions” and gang members’ holographic “light shields.” I enjoyed sort-of stepping back into that world here.